You go to great lengths to carefully decorate each room of your home. So, why is the first thing people see when they visit your home generally the last thing on your home "to do" list? With Pound Ridge Home Management, LLC, we consider your yard the "icing on the cake." Our landscaping professionals are here to help you make the outside of your home match the inside with the kind of care and attention it takes to achieve a photo finish for your property. We offer a complete and comprehensive landscaping package, that just like our management, you control according to your personal taste, needs, and budget. We will treat your property as if it were our own. We give ourselves 100 percent, and you get the same and more. 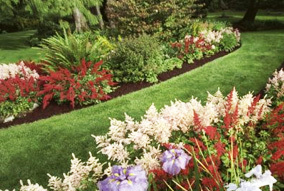 We also offer a fertilizer program for that perfect lawn and garden. Ask us about our complete landscape contracting services! We offer complete plantings of trees, shrubs, perennials and annuals, as well as, installation of walls, patios, and all types of fencing. If you want complete landscape installation, then we can offer the total package. Call us today, and we'll come show you how!